The High School Project on Astrophysics Research with Cosmics (HiSPARC) comprises a network of cosmic ray detectors across Europe that are used by secondary school students to investigate high energy cosmic rays. 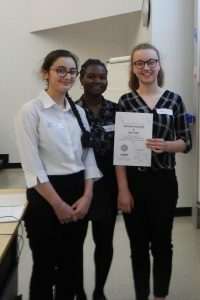 This project uses the detector at King Edward VI High School for Girls to investigate the effect of atmospheric pressure on the intensity of cosmic rays detected. There are currently many unanswered questions about the nature of cosmic rays. Where do they come from? How are they formed? Could they provide information about the Solar System and beyond? The HiSPARC project gets a little bit closer to answering them. Cosmic rays are high energy charged particles from outer space that constantly bombard the Earth. They were first suggested in 1912 by Victor Hess, who found that the level of ionising radiation in the atmosphere increases with altitude, suggesting its source is extra-terrestrial. It must be noted that despite their name, cosmic rays are not a form of photon. Although the Earth receives many forms of electromagnetic radiation from outer space, these do not constitute cosmic rays which are by definition fast moving charged particles. The exact source of these particles is contested, however it has been suggested that lower energy cosmic rays originate from the Sun and those with higher energy from supernova. These cosmic ray particles collide with molecules in the atmosphere resulting in the production of secondary particles such as pions, muons and neutrinos. The secondary particles go on to make further collisions and the number of particles increases into a shower, with the kinetic energy of the secondary particles decreasing with each collision (Figure 1). Eventually, no new particles are produced when collisions occur since the secondary particles have insufficient kinetic energy. Further collisions only result in the scattering of particles. Many of these secondary particles then decay into muons, however those with the smallest kinetic energy are captured by the nuclei of air molecules before they can decay. HiSPARC detectors form a network that spans Europe. They detect the muons that are the decay products of cosmic rays. Scintillator plates are used to produce a flash of light when struck by muons. This light is guided to a photomultiplier tube and on to the HiSPARC box which converts the analogue signal into a digital one. The digital signal is processed by a computer that is also connected to a GPS receiver to enable a precise time and location to be coupled with each detection. The project was initiated in the Netherlands in 2002-2003 and has since spread to Denmark and the UK. All the detectors are connected to a central server in Nikhev, Netherlands where the data is collated. The data from all detectors are available for analysis by students. There is an annual UK HiSPARC conference in which students share their investigations which range from trying to locate cosmic ray sources to analysing various factors affecting cosmic ray intensity. There are several variables that are thought to affect the number of cosmic rays detected at the surface of the Earth, which include solar activity, the location of the detector, and Earth weather. This project investigates how atmospheric pressure may affect the number of muons detected, by exploring the correlation between cosmic ray count rate and air pressure at the site of the detector. This is known as the barometric effect and was first identified by Myssowsky and Tuwin in 1926. 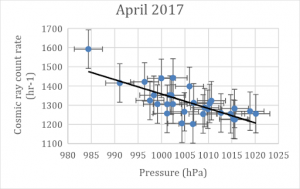 Other student investigations associated with the HiSPARC project have all obtained a negative correlation between the number of cosmic rays detected and air pressure, however the strength of these correlations has been varied. Many of these investigations conducted by other students only analysed data over a few weeks and some showed very little evidence that the validity of the data had been checked. This investigation therefore aims to address these issues in order to produce reliable and accurate results. 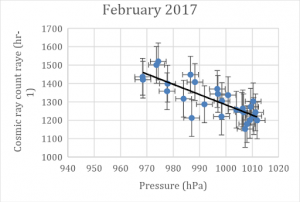 In addition to student investigations, Loran de Vries analysed the effects of several Earth weather variables, including atmospheric pressure, on cosmic ray intensity. 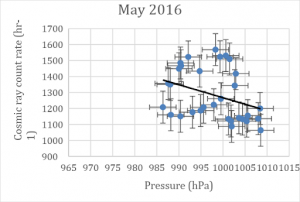 The paper used data from one of the HiSPARC detectors situated in the Netherlands and found a strong negative correlation of – 0.89 between count rate and pressure. 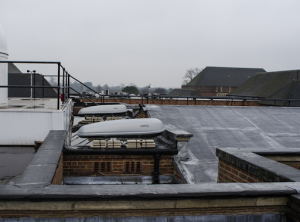 This project employed data from the cosmic ray detector at King Edward VI High School for Girls (KEHS) and pressure data from the school weather station. It was important to use time periods where continuous complete datasets were available, since there were some months in which either the HiSPARC detector or the weather station had not been functioning. 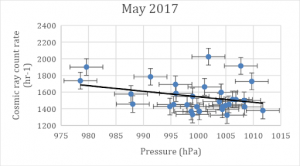 It was found that there was continuous data for April to June 2016 and January to May 2017. The first month looked at was April 2016. Time series of both cosmic ray count and pressure were produced and then a scatter graph of count rate against pressure was plotted (Figure 3). The scatter graph showed that there was a very weak negative correlation. Since the work of previous investigators had produced a more definite anticorrelation, work was done to try and find reasons for the weakness of the correlation. An apparent high frequency variation in the cosmic ray data can be observed, adding noise on top of the general trend (Figure 4). A Fast Fourier Transform was carried out to establish the time period of the noise, which was calculated to be 24.4 hours. This showed that there was a day night variation in the HiSPARC data. 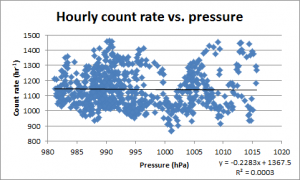 Since this variation was not due to changes in pressure (which showed no diurnal variation), it was decided that an average hourly value for the day would be calculated for both the cosmic ray count and the pressure data in order to smooth out this variation. Having carried out this process another scatter graph was drawn. This showed a slightly higher correlation (Figure 5). 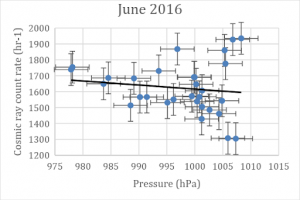 The same set of graphs were drawn for the months of May (Figure 6) and June 2016 (Figure 7). These showed stronger correlations than April however they were still very weak. Since none of the analyses had convincingly shown that pressure has an effect on the number of cosmic rays detected, an evaluation of the validity of the data was performed to check that the results were accurate. To check the HiSPARC data it was compared to that taken by a detector at the University of Birmingham, only a kilometre away from the KEHS detector. The data from the two detectors followed a similar general trend, suggesting that there was not a systematic error, and the data could be considered valid. The school pressure data was compared to data from a weather station in Coleshill, 18km from the school site. The two sets of data had an almost perfect correlation, thus validating the pressure data used. Since the data obtained was considered to be valid, it was decided that the remaining five months of complete data should be analysed to ascertain whether the results for the 2016 data could be reproduced. 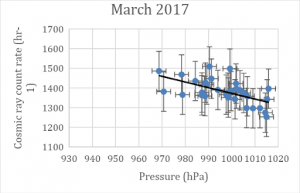 All of the months showed a negative correlation however there was some variation in its strength ranging from -0.30 to -0.81 (Figures 8-12). These correlations were much stronger than the 2016 ones. 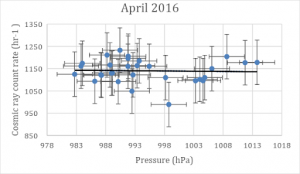 During each of the months analysed, a negative correlation between cosmic ray count and pressure was found. The strength of this correlation varied from -0.017 to -0.81. The reason for this variation in correlation could be due to the varying influence of other factors. Previous HiSPARC analysis by other students has shown that factors such as solar activity, earth storms and temperature have some effect on the number of cosmic rays detected. How these factors interact together is complex, especially due to the interconnected nature of different Earth weather effects and thus it is not surprising that there is not a consistently strong relationship between pressure values and the number of cosmic rays. However, since all eight months analysed showed a negative correlation it was concluded that there was a convincing relationship between cosmic ray intensity and pressure. Loran de Vries offered a theory to explain the negative correlation observed. At higher pressures there is a greater amount of material for the charged particles to pass through. 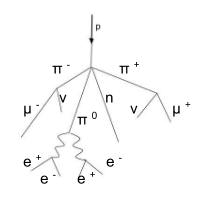 Therefore there are more collisions between secondary particles and air molecules. The secondary particles lose their kinetic energy more quickly and therefore more are captured by the nuclei of air molecules and less particles reach the Earth’s surface as muons. This effect is amplified since the primary collision will occur at higher altitude if the pressure is larger since the higher density of air molecules means that the probability of a collision is higher. Loran de Vries also attempted to formulate a mathematical model to explain why a linear relationship was observed. Their thesis assumes that when cosmic rays are passed through a given volume of air molecules the intensity will be reduced to a certain fraction of the original intensity. If the number of molecules in that volume is increased (i.e. the pressure is increased) the intensity is reduced by a higher percentage. The percentage change in intensity is proportional to the change in pressure. This is characteristic of an exponential relationship. The observed correlation in this investigation was linear, however, the theoretical model presented by de Vries predicts an exponential relationship. This can be explained since an exponential function can be written and an infinite power series (put simply, an addition of 1, x, x2 and so on). Since the pressure range is quite narrow about the mean this can approximated using only the first two terms of the sum, meaning it can be approximated and as a linear equation. Further work on this topic could include formulating a model that encompasses multiple variables and extending the study to include detectors at locations that experience a larger range of atmospheric pressures. 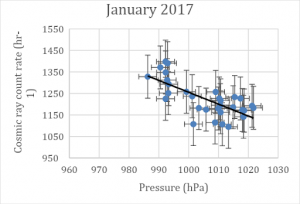 In summary, a linear negative correlation was observed between cosmic ray count and atmospheric pressure for all eight months where valid and complete data was available. This can be described by a mathematical model. There was variation in the strength of the correlation observed, probably due to the various other factors that are thought to affect cosmic ray intensity. Thanks must go to Dr M. Pavilidou and Professor C. Lazeronni of Birmingham University for their support with the project and to Dr Tedd (Head of Physics at King Edward the VI High School for Girls) for his guidance and hard work. Elizabeth Howell, “What Are Cosmic Rays?”, Space.com, May 10, 2018, https://www.space.com/32644-cosmic-rays.html. Loran de Vries, “Search for correlation between HiSPARC cosmic-ray data and weather measurements” (MSci thss., National Institute for Subatomic Physics, Amsterdam, 2012), 46-79. Gerard Osinga, An Introduction to Cosmic Radiation and HiSPARC, accessed January 29, 2019, http://physicsatbcs.weebly.com/uploads/1/9/0/3/19039659/introduction_to_cosmic_radiation_and_hisparc.pdf. All images and figures by authors. Jessica Tedd is passionate about physics and hopes someday to contribute to humanity’s understanding of the Universe. She is fascinated by the real life applications of physics and in particular the physics of living organisms. Blessing Adedayo loves studying the sciences and learning about the different parts that make up the complex world we live in. She hopes to study medicine at university as it applies all the sciences in order to study something almost as complex as the universe; the human body.  ⟵Can Artificial Intelligence tell the difference between ischemic and hemorrhagic stroke?